Therapak is committed to providing alternative green packaging solutions for the laboratory and pharmaceutical markets. The new Therapak EFC insulated shipping system is the next generation of environmentally sensitive packaging from Therapak. Each component of the EFC system is biodegradable, even the blue plastic liner! The EFC system can be shipped and stored flat thus saving money and storage space. The blue liner is durable enough for multiple shipments and safe for use with dry ice. Therapak EFC – thinking inside the box too! 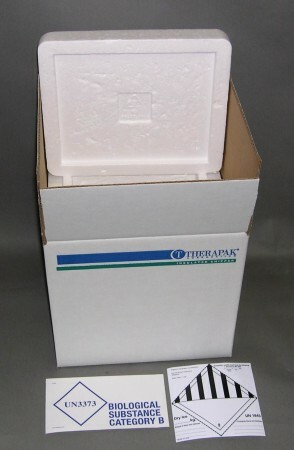 Therapak’s Compact Insulated Shippers provide thermal protection for your samples during transit. Each shipper comes with a small cooler and corrugated outer box. 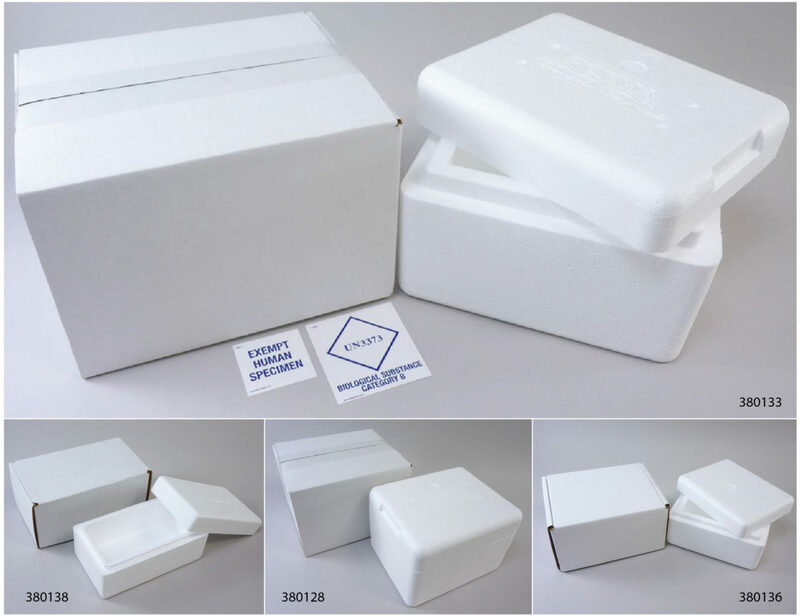 The plain outer boxes are fully customizable by adding preprinted labeling to the shippers, such as optional logo or required regulatory labeling. Additional components to ensure regulatory compliance, including absorbents and specimen bags, are sold separately. Each unit comes with a water-based temperature buffering gel wrap to help mitigate temperature fluctuations in the field. Shippers 380132 and 380139 come with a small EPS cooler, and shipper 380137 comes with a thermal reflective foil pouch. 380132 includes label set for Category B or Exempt Human Specimen shipment. The plain outer boxes are fully customizable by adding preprinted labeling to the shippers, such as optional logo or required regulatory labeling. 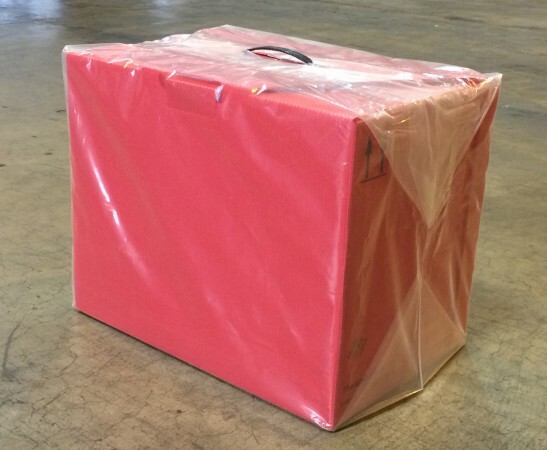 The Duramark Vacuum Insulated Panel (VIP) Shipper is ideal for the transport of frozen (<-20ºC) shipments. This sturdy shipper has been drop tested under dry ice conditions and temperature tested to ISTA 7D standards. The innovative insulation panels require less dry ice while offering long lasting temperature control. We offer a range of options to meet your needs: the small VIP shipper can maintain temperatures below -20ºC for 2 days using only 3 pounds of dry ice while the largest size maintains -20ºC for 6 days with 13 pounds of dry ice. The compact packaging requires less storage space, decreases freight costs and generates less waste. Therapak’s range of insulated shippers feature five popular cooler sizes that are inventoried at two locations in the United States (U.S.) in order to provide you with a maximum three day ground or truck shipment turnaround to any point in the Continental U.S. The two facility approach offers you freight economies to Eastern, Central and Western region shipping points. Therapak’s national warehouses are located in Buford, Georgia and Claremont, California. Insulated shippers (includes EPS cooler and corrugated shipping box). All insulated shippers are sold individually, in Best Pack quantities or in bulk palletized quantities. Best Pack quantities offer the lowest shipping rates per insulated shipper based on standard ground shipments via FedEx ground, UPS ground and other common carriers. Ordering in Best Pack quantities or multiples thereof will minimize freight rates to your location from Therapak. Extra small cooler – will hold up to two cold packs for a small refrigerated specimen shipment. 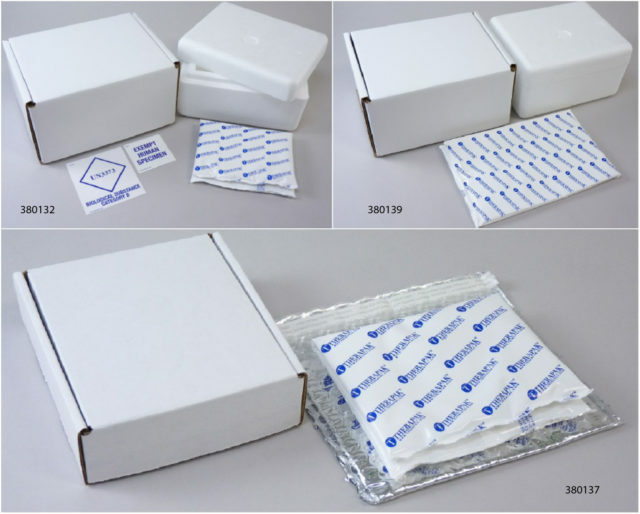 Small cooler – most popular size for routine specimen shipments of cold or frozen specimens in clinical trials studies. 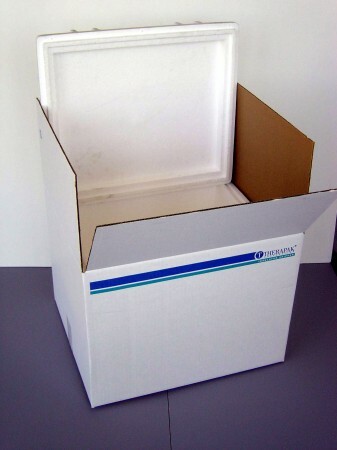 Can also accommodate one standard 2″ or 3″ cryostorage box. This is primarily an overnight shipping system for a single patient set of specimen tubes. 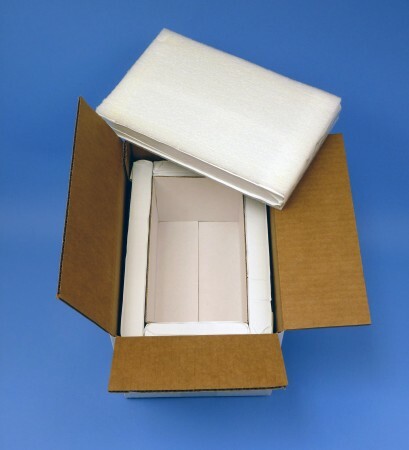 Medium – will hold up to two standard 2″ or 3″ cryostorage boxes. Also ideal for shipping up to five small specimen bags of sample tubes for clinical trial site shipments to a laboratory. Large – this system will hold up to 25 pounds of dry ice making it suitable for applications that involve frozen transport up to 72 hours. 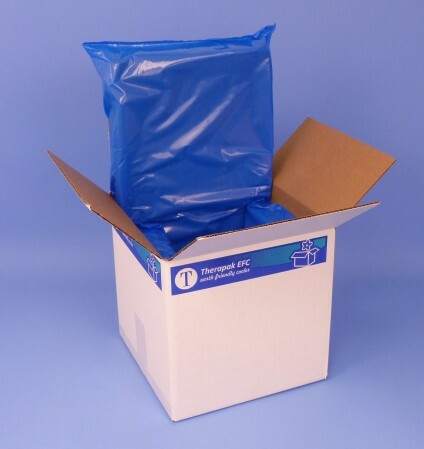 Also use for overnight shipments of multiple patient specimen packages where dry ice capacity may be reduced to accommodate more specimen bags or crystorage boxes. Extra Large – primarily for International frozen or refrigerated shipments of specimens requiring a high capacity of dry ice that will keep specimens stable for up to 4 days. Important: Please note that all suggested use comments are estimates based on historical experiences with these shipping systems. Therapak will not guarantee performance of any shipping system. Customers are encouraged to perform test validations for all shipping applications prior to accepting the standard risks associated with shipping temperature sensitive materials that are out of Therapak’s immediate control. Therapak provides three insulated shippers with standard DOT/IATA labels inserted inside the coolers for easy application to the shipper box at the point of specimen shipping preparation. These insulated shippers include the EPS cooler, corrugated shipper box, dry ice label and IATA UN3373 Biological Substance Category B label. Therapak’s integrated variable temperature transport system provides a cost-effective method for shipping samples collected at the clinic, hospital, or physician to a testing laboratory. The system offers variable temperature compartments within one courier overwrap container. The overwrap container consists of a 4-mm rigid and durable corrugated plastic container (Therapak No. 36520) that is reusable. The overwrap serves as a housing to accept various insulated polyurethane (PUR) coolers with lids. The PUR coolers feature one inch insulation. 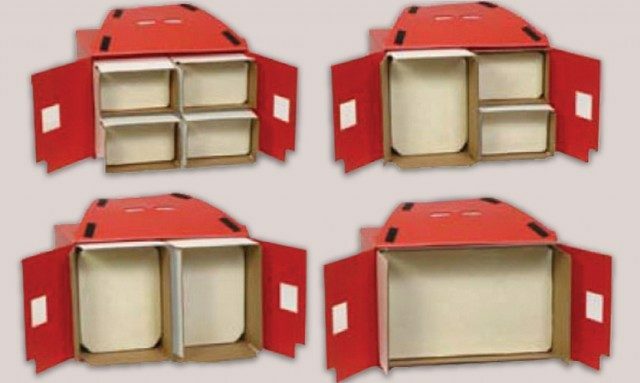 Depending on your daily specimen temperature requirements, laboratories or their designated couriers must evaluate the best internal configuration considering you can mix and match the insulated polyurethane (PUR) coolers within the courier overwrap container. There are four (4) interior configurations to choose from based on your temperature and transport requirements. The thermal efficiencies noted in these interior configurations allow transport of frozen, refrigerated and ambient specimens within one overwrap container. Overwrap container comes with easy-carry handle and features strapless closure system. Order corrugated plastic overwrap and PUR coolers individually or as a complete system to achieve interior configuration objectives for your transport requirements. Full customization is available for printing on the outside of the overwrap container. Minimum quantity for customization is 24 overwrap containers. Additional charges apply. The protective polybag prevents the build-up of airline labels and other adhesive stickers on our corrugated plastic shippers. The bag is attached prior to shipping with standard packing tape and is quickly removed at the delivery location. Click here to download use instructions.